The need to trust freeipa identity management with active directory is very interesting. It permits to centralize the user management leaving in freeipa the authorization process. Very useful for system administrator to have to manage one only user account. In this context this article explains how to integrate Freeipa with Active Directory describing all the kerberos packets involved in the process. 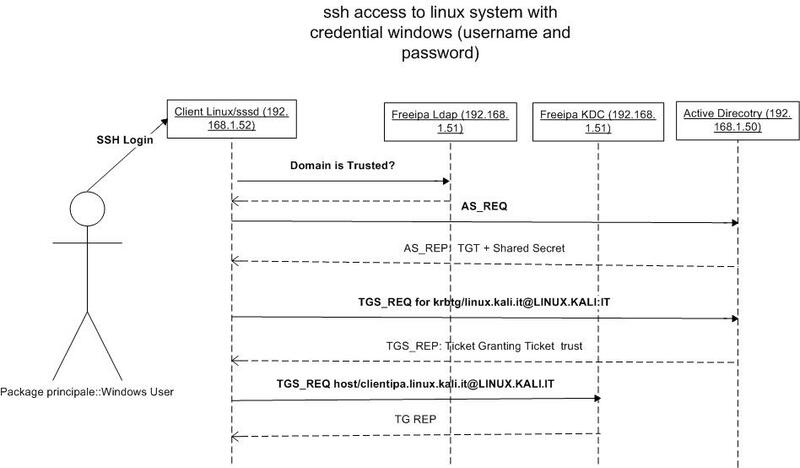 As you can see the authentication process is managed by Active directory by AS exchange messages; in the first picture the ssh login to linux client is by password; in the second with the TGT trust ticket obtained by AD, the windows client asks to Freeipa Server the service ticket for authenticating to ssh service without password: single sign on authentication. For who are new to kerberos protocol can be useful to read this article: http://www.securityandit.com/network/kerberos-understanding/. Login to client linux by ssh if freeipa administrator permit it. Sudo enabled if freeipa administrator permit it. Changing password directly on linux system. The freeipa documentation available at http://www.freeipa.org/page/Active_Directory_trust_setup is very clear even if something is missing. I will follow this documentation for installing and configuring the freeipa server 4.2 trusted with Active directory Server 2012. For Windows 2012 I installed the iso downloaded from https://www.microsoft.com/en-us/evalcenter/evaluate-windows-server-2012-r2. I installed and configured an active directory instance: I don’t explain how to do because in internet there are a lot of articles about that. Before starting, the meaning of trust between Freeipa and Windows must be cleared. The trust is only one way: it means that the configuration permits the users from AD domain to access to freeipa domain resources and not viceversa. Windows domain users like stefano.gristina@kali.it can be authenticated to linux domain resources with a principal like host/clientipa.linux.kali.it@LINUX.KALI.IT because the Ticket Granting Ticket Trust released by active directory is signed by a secret key shared with freeipa KDC during trust operation. This ticket is used for obtaining service ticket. After this introduction, let’s to show the realms, the domains and the ip address involved in my laboratory. The active directory forest with root domain kali.it is trusted with the forest root freeipa domain that is linux.kali.it. In this scenario the freeipa domain is a subdomain of window domain. The freeipa server is 4.2, it doesn’t use anymore old cipher like DES and RC4: it means that the trust will not work with old windows server 2003. The IPA server requires an administrative user, named ‘admin’. Support for trusted domain is enabled setting a netbios name for linux domain. This is a prerequisite because active directory expects from remote side a netbios name. Configuring cross-realm trusts for IPA server requires password for user ‘admin’. Up to 15 characters and only uppercase ASCII letter and digits are allowed. Enter the NetBIOS name for the IPA domain. Only up to 15 uppercase ASCII letters and digits are allowed. WARNING: 3 existing users or groups do not have a SID identifier assigned. Let’s configure now DNS forwarder on freeipa server. Remember to configure as resolve name server the ipa server ip address for all linux systems. Server will check DNS forwarder(s). _ldap._tcp.kali.it. 600 IN SRV 0 100 389 win-irb94ovlapt.kali.it. _kerberos._tcp.kali.it. 600 IN SRV 0 100 88 win-irb94ovlapt.kali.it. Jun 04 03:26:17 ipaserver.linux.kali.it systemd: Failed to start Identity, Policy, Audit. Jun 04 03:26:17 ipaserver.linux.kali.it systemd: Unit ipa.service entered failed state. Jun 04 03:26:17 ipaserver.linux.kali.it systemd: ipa.service failed. From another shell, before that freeipa goes down a samba service principal must be created and the keytab imported on ipaserver. Now it’s time, with AD Administrator credential, to enable the trust beewten freeipa and active directory. Add these lines in /etc/krb5.conf and restart kadmin and sssd. If everything has been done fine, it will be possible to login by ssh to ipaserver with a windows user without credentials. Remember to align the date on Windows and Linux system to equal value. These kerberos transactions will be explained better after client freeipa installation and configuration. The freeipa client is installed on centos 7 linux machine. After installing and configuring it, it’s possible to login by ssh with windows credential or using service ticket obtained from a windows user authenticated to a windows client. The first thing to do, after installing ipa client, is to configure it. If everything has been done fine, the ssh kerberos authentication to ipaclient from freeipa client or windows client must be completed with success. Below the ssh connection is done by ipaserver. The user used is windows administrator that has the right grant to access to any system because the domain admins belong to freeipa admin. The freeipa client installation and configuration is completed. In the next paragraph an real life example is showed: a windows user with sudo grant connects to linux system and from here changes his password in active directory. The trust beewteen active directory and freeipa has been completed. 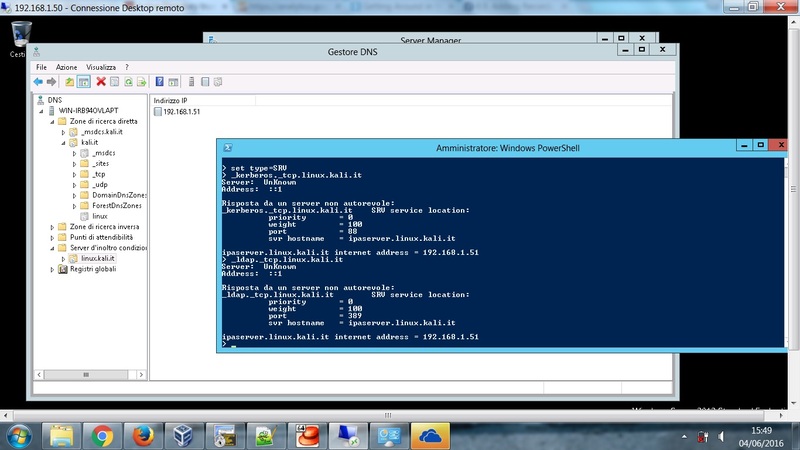 A windows user from windows system can login remoteley by ssh to linux world using kerberos authenticating. 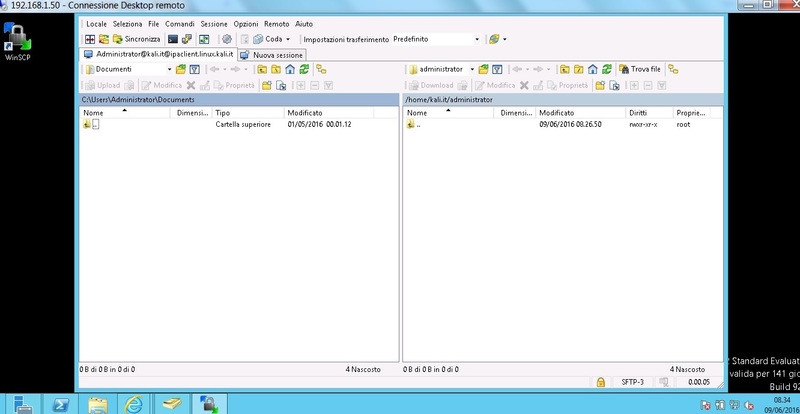 For our case the administrator user is used for the tests. As done above, the domain admins belong to admin freeipa group: it has the grant for login to all linux systems. We could do the same login by a normal domain users. The important thing is to create on freeipa the right mapping beewteen domain users and freeipa group and give to this freeipa group the right grant for accessing to linux system. All that can be done by GUI freeipa. Changing password for user administrator@kali.it. Configuring a sudo policy on freeipa for ad_admins, it’s possible to get root permission by sudo command. 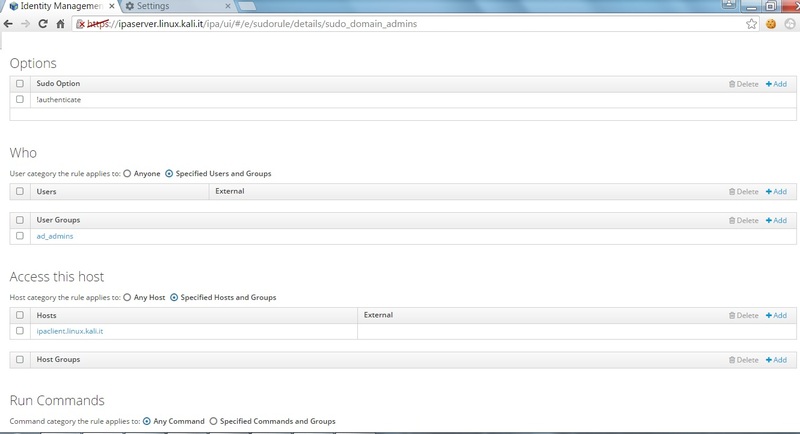 Configure the sudo rule on freeipa by GUI clicking on add button in Policy/Sudo sheet. AS/REQ is sent from linux sytem to active directory kerberos. The ad kerebros ip address is detected by dns: a srv query like _kerberos._udp.kali.it. The AD returns in AS REP a TGT that is used next for a service ticket to host/ipaclient.linux.kali.it@LINUX.KALI.IT. The TGT_REQ for this service ticket is always sent to AD. The AD returns in TGT_REP a new ticket signed with a key shared with freeipa during trust procedure. With the ticket above, the linux client can ask to freepa KDC the service ticket for host/ipaclient.linux.kali.it@LINUX.KALI.IT. The important thing to understand is that: Active directory manages the authentication, freeipa the authorization. That’s all. The freeipa trust with active directory is very interesting for a company. The access to linux system is centralized in active directory and freeipa has the responsability for the authorization process. It’s possible to have more freeipa server replicated with more linux domains under a principal domain that is in trusted with windows. In this way every organizational unit with its domain (uk.linux.kali.it, fr.linux.kali.it, etc..) is trusted with active directory domain root kali.it. The freeipa is the right and best solution for who wants to have an identity management like active directory for linux world. Use it and you will save time for managing the linux authentication and authorization process. Doesn’t hesitate to contact me for any problem during freeipa trust installation and configuration. Excellent instructions; this is the closest to what I’ve been trying to do. I need to allow AD users the right to login to a Linux host and run ‘sudo’. These are the same steps I had used, but I’m continually getting errors with ‘sudo’ that the user is not in the sudoers file. I have a 2012 AD domain (one way trust) with a CentOS 7.2 IPA domain. I’ve found some troubleshooting documentation regarding problems with sssd 1.13 (need 1.14), but from your instructions, it doesn’t seem to be an issue. I already answered to Shane. Don’t hesitate to contact me for any issue. I’m trying to find how to grant AD users access to freeipa UI and assign SSH Public Key to them. Any ideas ? Thanks. Great Question. I think that this is not possible. The ssh public key can be assigned only to freeipa user. I will investigate about it. You could use GSS API authentication for having a free password authentication. The method from the link I pasted should do the trick, but in my case it takes ages for the submitted public key to work. You must be sure before starting the trust command that the dns integration between IPA and Windows has already been done. 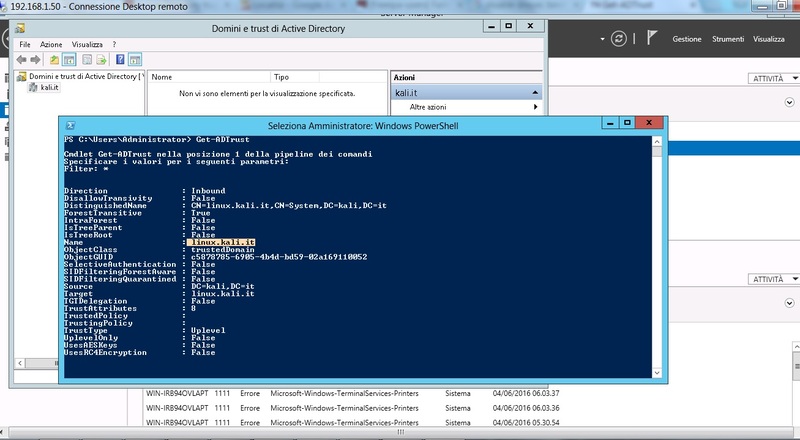 This permit to ipa to discovery the win.ipa Controller domain. Let me know if it’s enough. Hello. Thank you for help. But i cant establish trust.